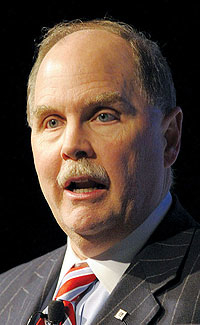 GM COO Fritz Henderson said bankruptcy would add expense to the bailout. DETROIT -- General Motors and Chrysler LLC included bankruptcy scenarios in the viability plans they submitted to the federal government today -- but both companies continue to reject the option. The automakers said the cost to the federal government would greatly exceed that of the current bailout program. So far, GM already has received $13.4 billion in federal loans; the company now seeks an additional $9.1 billion in loans, plus a $7.5 billion line of credit. Meanwhile, Chrysler has received $4 billion of the $7 billion it requested in December. Now Chrysler says it needs an additional $2 billion, for a total of $9 billion. Both companies cited deteriorating auto sales as a major drain on cash flow. GM COO Fritz Henderson said bankruptcy would add expense to the bailout because the federal government would have to provide debtor-in-possession financing -- the money used to operate a company during bankruptcy. Although such financing usually comes from private sources, that would be impossible in the case of a company of GMs size, Henderson said.  A pre-packaged Chapter 11, which would require advance approval of debtholders for a debt-reduction deal. Likewise, it would require the UAWs advance approval of a debt-for-equity swap for money owed to the UAWs health-care fund for retirees. Henderson said this would take about 60 days and cost the federal government $9 billion more than an out-of-court restructuring.  A traditional Chapter 11 bankruptcy would take 18 to 24 months and cost $50 billion to $60 billion more than an out-of-court deal, according the Henderson. Plus, Henderson said, sales would fall off a cliff because consumers would lose confidence. Nardelli said a liquidation would cost taxpayers a lot more than a successful out-of-court restructuring with a $9 billion loan. If Chrysler reorganized in Chapter 11, according to the company plan, it would require $24 billion in debtor-in-possession financing over two years.